GARMENT DISTRICT — Pandas, and camels, and cats, oh my! 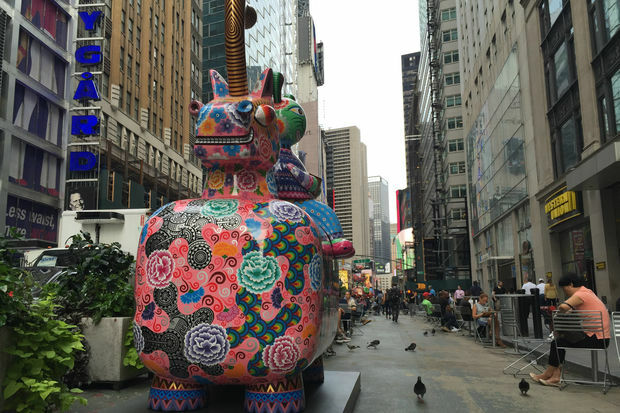 A series of huge, colorful sculptures resembling fantastical versions of pandas, eagles, bulls, and other creatures appeared along Broadway over the weekend, dotting pedestrian plazas in the Garment District from 36th Street to 41st Street. The sculptures, which were unveiled on Tuesday, are the work of Hung Yi, a Taiwanese restaurateur, and will stand along Broadway through mid-April 2017, according to Barbara Blair Randall, president of the Garment District Alliance. The tallest of the sculptures, a giraffe, stands about 15 feet tall, and all the creations depict cartoonish and brightly colored animals with exaggerated proportions, covered from top to bottom in bright paint and scrawled with blessings and good-luck wishes, Randall said. The exhibit includes eight sets of creatures, and 11 sculptures in total. They were originally supposed to be on display for about three months, but the time was extended because of the prospect of how beautiful they would look when covered in snow, according to Emmanuel Fremin, whose eponymous gallery facilitated the exhibit. “In the winter the color will really pop,” he said. The sculptures were made from steel in a Taipei workshop and Yi enameled and hand painted them himself, along with help from a crew of workers, Fremin said. “He’s kind of like Jeff Koons, except he does the work himself,” Fremin said.